Twice Knit Knitting is a type of Double Knitting. I just recently came across this technique; it is briefly mentioned in The Reader's Digest Knitter's Handbook. I was immediately intrigued, and an amazon search turned up Twice-knit knitting , by Lee Gilchrist. This is not a new book, however apparently not a technique that is widely used these days. I only found one or two blog references in my search for information. In Twice Knit Knitting, you are working each stitch twice. You might think this uses more yarn and time, but it does not. The act of working each stitch twice interlocks the stitches so that they actually do not unravel! 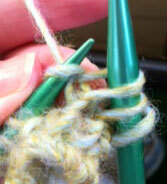 You can use bigger needles and finer yarn for quick knits; the smaller the needle, the more dense your fabric will be. A very dense fabric is great for pot holders or hot pads, garments should be knit with larger needles so the fabric will have some drape to it. As with any knitting, swatching is the best way to find out if you like the way the fabric looks and feels using a particular yarn and needle size. 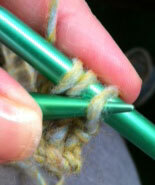 The book instructs you to begin with a slip knot, then using the knitted cast on method, cast on one more stitch. 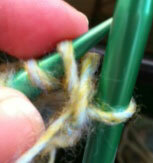 I do not like slip knots - so I cast on two stitches using the long tail method. 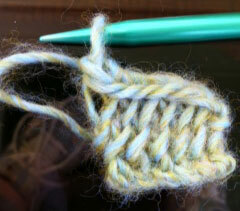 Then, to cast on additional stitches, you are going to do a 'modified' knitted cast on. 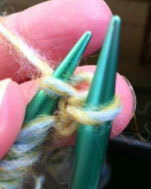 Always work with the first two stitches on the left needle. To work a row of knit stitches, as with the cast on, you will always be working with the first two stitches on the left needle. The big thing to remember now is that you do NOT want to drop both stitches from your left needle - you will only be dropping the first stitch. 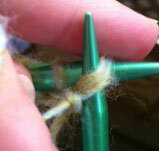 Leave your second stitch on the left needle so you can work it again with the third stitch. Remember, in Twice Knit Knitting, each stitch is worked twice! The first double knit front stitch has been made. The new stitch is on the right needle; you can see the loop of yarn between the needles - that is the first stitch from the left needle. The second stitch remains on the left needle. In this picture, you can see I have worked the first two stitches on the left needle and created a second stitch on the right needle. The first stitch has not yet been dropped from the left needle. Continue working the next two stitches on the left needle, dropping only the first stitch each time until you come to the end of the row. When you come to the last two stitches, work them together as normal, dropping the first stitch, and then simply knit the last stitch by itself. To work a row of purl stitches, you again will be purling the first two stitches on the left needle together, dropping only the first stitch from the left needle. The first stitch has now been passed over the second and third. Work another stitch from the left needle, then pass the first stitch on the right needle over the second and third. Continue binding off in this manner until you reach the last three stitches. 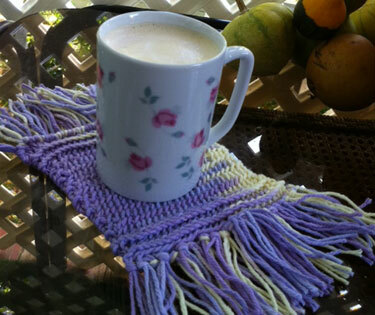 Treat the last stitch as you would any final bind off stitch. Cut the yarn, pull it through, and weave in your ends. And there you have a tutorial on Twice Knit Knitting! I do recommend purchasing the book; you will learn to do the Double Back Knit Stitch, along with the stitches created with this technique: Silhouette Stitch, Herringbone Stitch, Braid Stitch, and Graphic Stitch. Apparently you don't even need to bind off if you don't want to, because the stitches won't unravel. Also, you are supposed to be able to cut your finished piece as you would a regular piece of fabric. I have not yet figured out how to do this, and don't see detailed instructions in the book. I tested the cutting of fabric on a small piece, only to have it unravel! So, while there is obviously a particular way this has to be done, I am not aware of it at this point. Bind off. For the fringe, cut 4 inch pieces of yarn. I used two strands in each of my cast on and bind off stitches, but you can use more strands and/or space them out along the edges to suit your taste. Trim if you like, or leave the fringe wild and crazy! Also, here is a video demonstrating the Double Knit On, Double Front Knit, Double Purl, and binding off. Enjoy!! Cool! I'll have to add this to my ever-growing list of things to try. =) Your tutorial and pictures/video are very clear and make it all easy to understand. Thank you for all the time you clearly put into this post! You're the best! I love the way you teach, very easy to understand, slowly enough to see in detail and the stiches pretty nice...originals. Thank you!!! Hi, I am in search of the increase of this stitch or your other video of the similarly executed herringbone. I recall learning how to, but I don't know where. If it was you or in one of your videos, would you please direct me to it! I am in need of how to increase and decrease. I think it was a version of the herringbone, rather than this one...Perhaps it wasn't a video, but a pictorial or even text. Thank you so much for responding, in advance. I'm sorry I can't locate my book on this technique. If I find something I'll be sure to post. Unless otherwise noted, none of the products reviewed or mentioned have been provided by their respective distributors, nor has any money been paid by them for a review of the products. All product reviews are based on my opinion and have been purchased by me.